In a bid to protect migratory birds from getting hurt from electricity transmission lines or wind mills, the Bombay Natural History Society (BNHS) will create satellite (global information system – GIS) based maps of migratory routes across the country by next year. The Union environment ministry approved the proposal submitted by BNHS — the oldest nature conservation group set up in 1883 — earlier this month to replicate the idea of flyway maps developed by European countries to study bird movement. 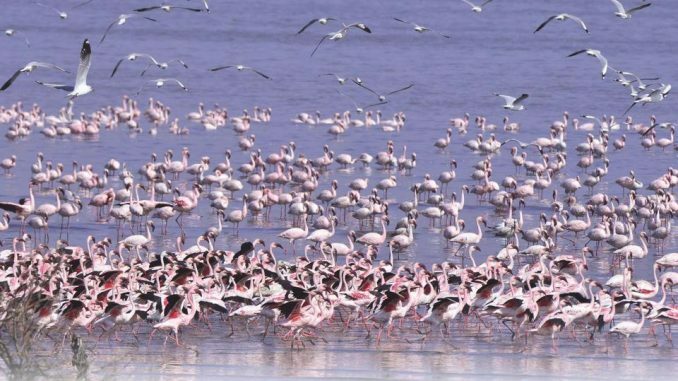 According to BNHS, migratory species like flamingos have been dying due to the presence of high tension wires on their way along coastlines in Gujarat, Maharashtra and other parts of the western coast. Certain areas record hundreds of bird deaths every year, according to BNHS. Wildlife experts said while a number of green energy projects have been sanctioned by the Centre, mostly related to wind energy and setting up of wind mills, the environment impact assessment (EIA) for such projects do not look at the migratory route of birds that could be obstructed by the projects. There is no data on migratory routes. With almost 70 years of experience in tracking birds and keeping records, BNHS has a repository of over 500 important bird areas (IBA) in India that have been identified under various global criteria for their recognition. The database includes wetlands, endangered, endemic, threatened and range-restricted bird species. The maps will be colour coded on the basis of red, brown and green corridors identifying maximum avian traffic with red to least traffic with green. BNHS plans to do the pan-India mapping using their existing data, geocoding (provide geographical coordinates) it, placing it on a software that will use GIS maps and access the routes. BNHS has ringed over a million birds at different places in the subcontinent, with the initiation of bird ringing study in India in 1959, funded by the World Health Organization, and has spent over Rs35 crore for collecting this data. Earlier this month, BNHS was selected as the nodal agency for Maharashtra for bird ringing across the state by the forest department. “For Mahrashtra, we will collect data from individuals, NGOs and various other organisations and put together a massive database of avian migratory patterns. The data will be shared with the state government on an annual basis and flyway maps will be developed for the state first and then replicated for other states,” said Apte. “There are numerous routes followed by migratory birds and most of them are untraceable. If organisations like BNHS can help identify these routes through data, not only will it help conservation but a number of different sectors including aviation, infrastructure and scientific community will also benefit from it,” said a senior official from the Ministry of Environment, Forests and Climate Change. “Sensitivity for the environment is always welcome but it has to be tempered with practically. The predatory activity of human beings can also be tracked throughout the country and abroad by identifying migratory routes,” said Satish Gavai, principal secretary, state environment department.